We offer a permanent solution with a 5-year warranty. There are many Beaufort pest control companies, but most deal with extermination of insects. We deal strictly with wild animals, such as raccoon, skunk, opossum, and more. Palmetto Wildlife Extractors differs from the average Beaufort exterminator business because we are licensed and insured experts, and deal only with animals. We are not merely trappers, but full-services nuisance wildlife control operators, offering advanced solutions. Beaufort wildlife species include raccoons, opossums, squirrels, rats, skunks several species of snakes and bats, and more. Many animals can cause considerable damage to a house, not to mention contamination. We offer repairs of animal entry points and biohazard cleanup and we guarantee our work. Our Beaufort rodent (rat and mouse) control is superior to other pest management companies. All of our wildlife trapping is done in a humane manner. Of course, we are properly South Carolina state licensed. 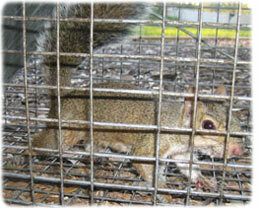 We are highly experienced in Beaufort raccoon removal, squirrel removal, bat control, and more. We at Palmetto Wildlife Extractors believe we are the best Beaufort trappers of wildlife, and would be happy to serve your Beaufort bat removal or pigeon and bird control needs with a professional solution. Skunks, moles, and other animals that can damage your lawn - we trap them all. Our professional pest management of wildlife and animals can solve all of your Beaufort critter removal needs. Our specialty is removal of animals in homes such as raccoons in the attic or squirrels in the attic. If you need Beaufort pigeon control, Canada geese or other bird removal, we can help. We are experts with skunk problems, digging animals such as armadillos, & groundhogs, and we offer South Carolina dead animal removal. We trap mice and voles. We do home repairs, animal prevention, and removal of critters from the attic, ceiling, basement, animal in the wall, and any part of a building. Give us a call at 843-325-2666 for a price quote and more information. 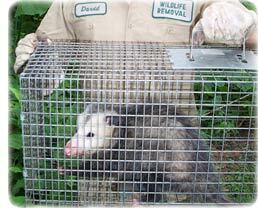 Remember, we at Palmetto Wildlife Extractors run a wildlife removal company, and charge for our services. If you are searching for help with a dog or cat issue, you need to call your local Beaufort County animal control or SPCA. They can assist you with problems such as a dangerous dog, stray cats, lost pets, etc. There is no free service in Beaufort County that provides assistance with wild animals. Sick raccoon symptoms - Raccoons, just like all animals, get sick. Much like people, they experience indigestion, nausea, fevers, chills, and a host of chronic illnesses like kidney disease and arthritis. As you might imagine, when the raccoon doesn't feel well, you'll see a lot of the same symptoms you'd see in any other living creature. The best way to determine if a raccoon is sick is to know what that animal acts like when it's healthy. Most raccoons are active at night, but that doesn't mean seeing a raccoon during the day means the animal is ill. Sometimes starvation can cause animals to act out of their natural inclinations, and raccoons near cities and suburbs will adapt to the people around them rather than remain on instinctual time routines. A healthy raccoon will be wary, stable in gait, hungry, and active. If you see one that isn't behaving like it should, that is cause for alarm. Signs of a serious illness like rabies will be obvious; you'll see excessive salivation, poor balance and inability to walk, unnatural aggression or boldness, and loss of appetite. Generally, any time a starving raccoon won't eat is a signal that the animal isn't well. (Beaufort County) We're a week into rat and mouse rifle exterminating season. And already people all over our area are grabbing their camo pants, neon hats, and rifles. It's a sport that some people don't understand... And others can't get enough of. Most local owners of pest control companies in Beaufort, South Carolina weren't sure what to make of all this. Jeffrey The insect and rodent professional, a exterminator says, "Oh it's great. I love exterminating. I'd rather control than do anything else." Rat and mouse season will run until January 2nd. Between now and then exterminators are allowed to shoot just 2 rat and mouse per day. That can be a combination of a female rodent and a buck, 2 bucks, 2 doe, it makes no difference. But exterminators can't take shots during darkness. That's 30 minutes before sunrise or 30 minutes after sunset. Beaufort pest control is mostly insect extermination, but only a few South Carolina companies deal with wild animals. A safety precaution for the sportsman themselves, each exterminator must wear a hat that can be seen 360 degrees around them. And wildlife officers have an answer for people who believe killing rat and mouse is wrong. They say exterminating the animals is an important part in the circle of life. And we risk overpopulation if some aren't killed every year. The Beaufort County Pest Control board of Beaufort exterminators could not be reached for comment. If you need Beaufort raccoon removal, rat trapping, squirrel removal, or have any questions about a wildlife problem in Beaufort, please give Palmetto Wildlife Extractors a call at 843-325-2666, and we will listen to your problem, give you a price quote, and schedule an appointment, usually same day or next day, to solve the problem.